I like maps. I like my home state of Oregon. 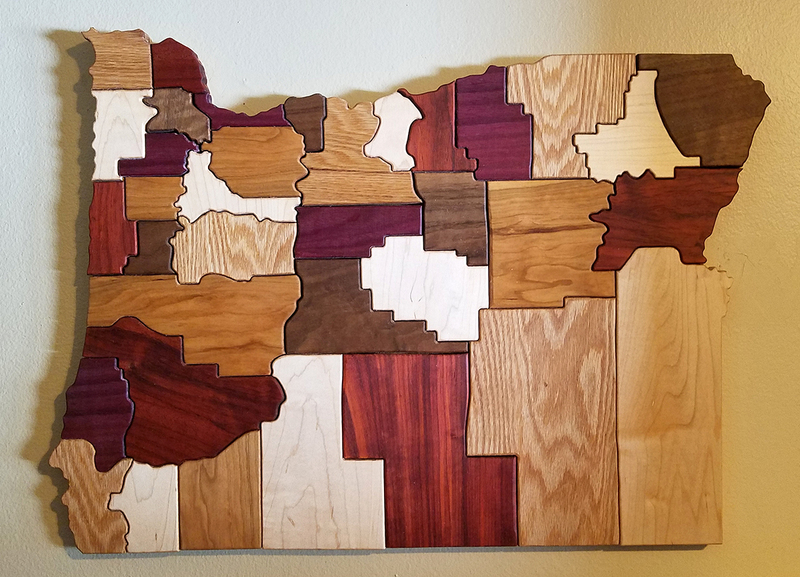 So why not make a map of my state with my XCarve? First, get the counties. There are 36 in Oregon. 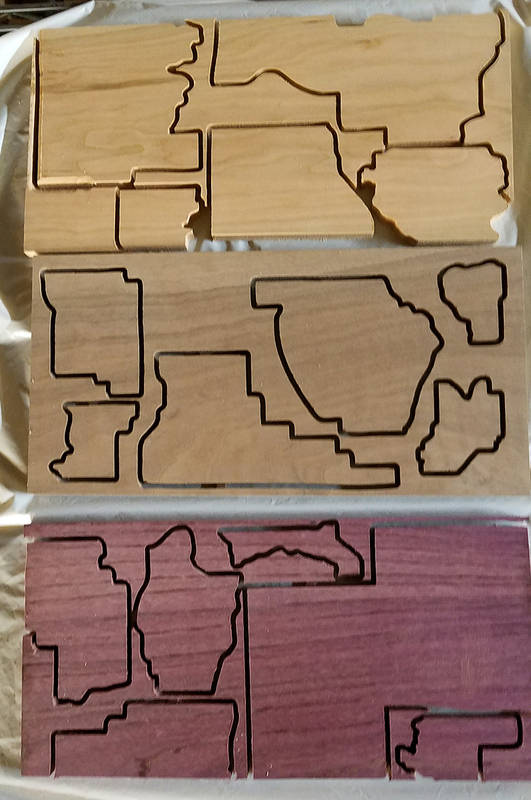 Playing around with the map, I figured I could use six different woods so there were no adjoining woods. 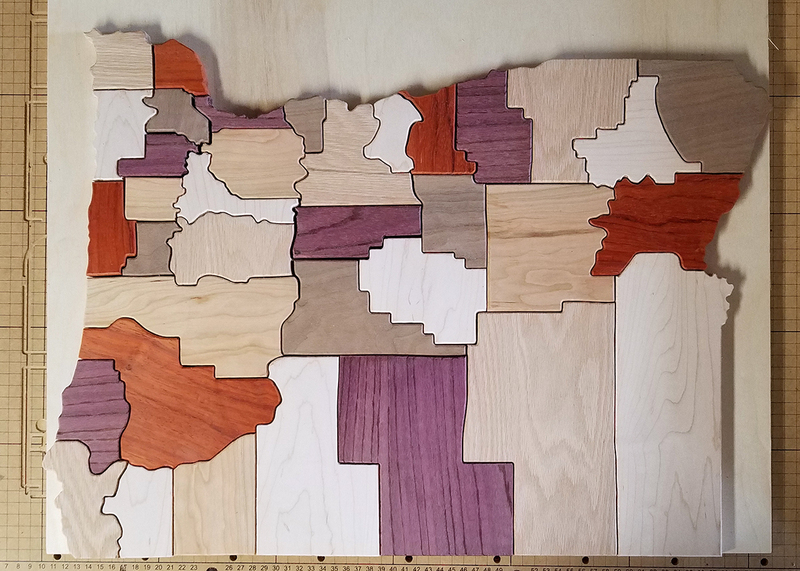 Handily, six colors go into 36 counties exactly six times. I used the 6x12x1/2" hardwood blanks from Inventables, so the largest county needed to fit in that. This meant the entire finished piece would end up at about 2 feet wide by 1.5 feet tall. Pretty sure I used Padauk, Oak, Maple, Walnut, Purpleheart, and Bamboo. In order to make sure they fit together nicely, I re-drew the map in Illustrator to ensure there were no inside corners less than 1/8" wide, the width of the bit I used. I also smoothed a bunch of the lines and corners to be more aesthetically pleasing while still providing the most accurate outlines. Then I split the counties all up into separate outline paths and juggled their placements on the 6x12 blanks. The actual routing out took surprisingly little time, it was the smoothest part of the project, in fact. Drawing and re-drawing took many hours, routing took fewer hours. The cleanup took a ton of time, mostly because I was teaching myself some of the finishing work. Sand and finish entire thing, including cleaning up glue spots, high spots, etc. It’s currently hanging on my bedroom wall. I thought about reproducing and selling this, but the time involved isn’t feasible to make a profit so I’m classifying this as “artwork” rather than “production”. 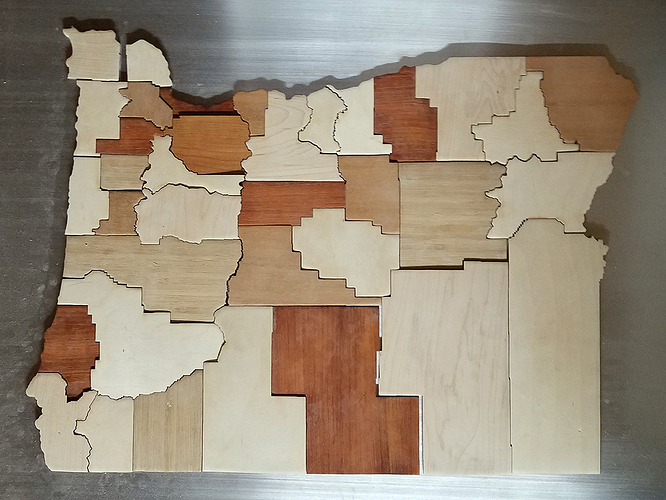 I’ll probably do some more states later, now that I know more. But I’m pretty happy with the outcome. Dad was from Oregon, and I spent a lot of time there over the years - mostly in Depoe Bay. Congrats on a beautiful piece. Looks fantastic. You did a great job. Well done and thank you for the write up. This is amazing. Super nice. It really is art. Thinking about it even more … you did all the work on design… I wonder if you could have something that is less work but would draw high prices using different colors of lexan or something? Good question, I’ve thought about that. 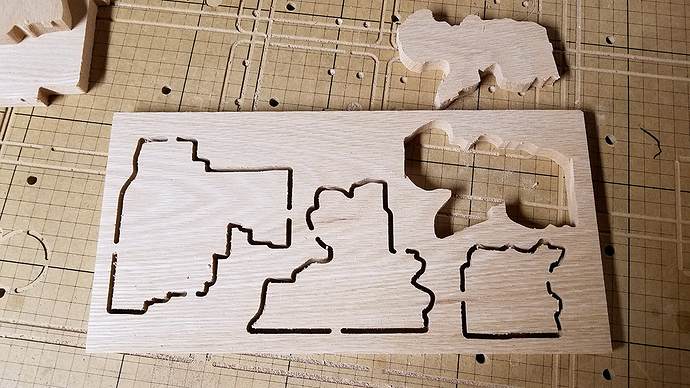 In fact, the one above is only half of the project, the other part was laser cutting using the unsmoothed actual USGS shapefile boundaries (I also have a GlowForge). I haven’t finished this one yet, here’s a picture of it in progress, not yet glued or finished. This one is much less labor intensive so far, even with brushing the aluminum background. The look is a little different, harder edges; it’s more techie, less woodsy, if that makes sense. I tried it both ways to see which I liked better. But I like your idea of differently colored acrylic or something like that, I might try that and see how it looks. That’s really cool! I like the community aspect, and how he made the frame for it. Great job. I personally like the routed version best. Have you thought of combining X-carve & your laser, like cutting out the counties on the X-carve and then using the laser to engrave the county names? For total map nerdiness you could also engrave major towns & roads. I’ve got a GlowForge laser, so I’m thinking of doing something like that, yeah.